The view from the air as you fly into Port au Prince, Haiti, is starkly dramatic. If the skies are clear, you can catch a glimpse of the dramatic difference between the eastern half of the island — The Dominican Republic — and the western half of the island which comprises Haiti. While green to a degree, it’s a lighter color green than the dark, forested eastern half. Much of Haiti has been deforested. As you descend into Port au Prince, you also notice the starkly different color of Port-au-Prince Bay. While the water surrounding the island is a deep, beautiful, tropical blue, the water in the bay is brown, more like the Mississippi River than the Caribbean Sea. In the aftermath of the European colonization of the Caribbean, Haiti became a French colony, heavily populated by slaves from Africa who worked the fields, especially sugar cane fields for the production rum. In the late 18th century, a slave rebellion kicked the French off the island, and the former slaves became the rulers. At the risk of a bit of oversimplification, the past 200 plus years of Haiti’s history has been the oppressed revolting oppressors who were formerly the oppressed. The political history has been intertwined with an devastating environmental history. From early on, charcoal has been the go-to fuel for cooking. Trees are necessary for the production of charcoal. Producing enough charcoal to keep up with the demand of an every growing population meant that over the years, more and more trees were necessary. 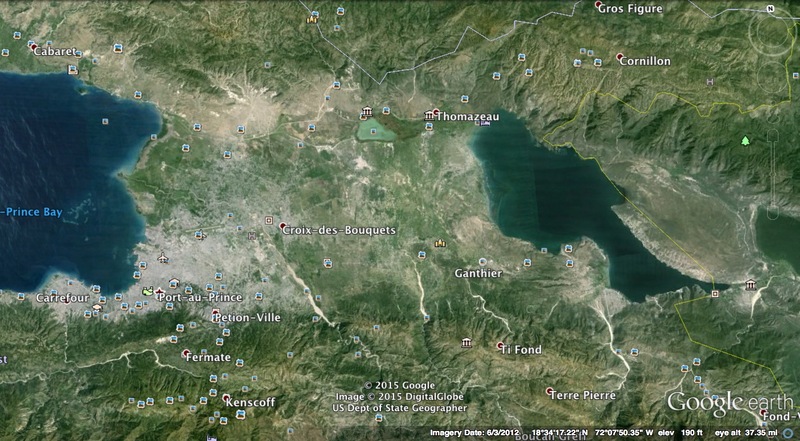 Eventually, large swaths of the country were deforested, especially the hills and mountains directly east of Port au Prince. Haiti is a mountainous country; so, the disappearance of the trees stole the land of the anchor that held the topsoil in place, and eventually, the top soil eroded away. Hence, the brown color of Port-au-Prince Bay. Haiti is one of the poorest countries in the world. Often left out of the explanation of such poverty is the historic destruction of the environment. In the 90s, when the church I was serving partnered with a school and orphanage in the rural area east of Port au Prince, we found villages of people trying to grow subsistence crops on land that had no topsoil and little nutrients for plants. One of our volunteers was a retired official from the US Soil Conservation Service and began a process of using compost and other organic matter to try to rebuild the soil. It was a process that at best would take years; and the villagers were not keen on changing the farming methods that they had been using for generations, even with the promise of more and better food. Haiti supports human life; but it’s not good life. It’s difficult life with dim prospects for much improvement. Turns out Haiti isn’t the first place such disregard for the land itself has led to such devastating effect for the people who live there. In Earth-Honoring Faith, Larry Rasmussen tells the story of how in 1942, Walter Lowdermilk wrote a report for the U.S. Soil Conservation Service documenting how the land of Lebanon, the Sinai Peninsula, Jordan, Syria, Cyprus, North Africa, and Greece had been seriously damaged leaving behind washed-off soils, silted canals, meager flora and fauna, and the ruins of dead cities. The rapid degradation of the environment around the world — our gluttonous thirst for oil and dependence on internal combustion engines, our hunger for meat and vegetables produced by corporate agriculture, the mind-boggling consumption by consumers in first-world nations, and the list goes on and on — is repeating on a global scale the mistakes that were made in Haiti over a couple of hundred years, not to mentions mistakes that have been made in particular locations throughout history. We are unwittingly, and for short-term convenience wrecking the environment for the sake of the lifestyle we have become accustomed to. And we are unable or unwilling to recognize the cliff we are heading towards and do anything about it. This week the Chicago Tribune ran a story about tiny Earlville, Illinois abut 70 miles southwest of Chicago in the midst of a controversy over whether to allow the construction of a transportation center for the trucking of mined sand for fracking. Those in favor cite the jobs that will be created. They also look to the experience of a small Texas town that allowed the construction of such a transportation center; in exchange, the company built the town a football field. That sounds like a lousy trade-off. And the very definition of myopic vision about the precious planet we call home. For a person of faith, it’s a matter of wise stewardship of the planet we call home, of the faithful care of God’s good creation. For all of us, it’s an increasingly urgent matter of survival. Just look at Haiti. This entry was posted in life in the world and tagged creation care, deforestation, earth care, environmental degradation, haiti, myopic, soil loss, stewardship of creation on May 13, 2015 by Jim Honig. “Heading Towards Haiti”? Your blog is unclear. Are you heading back to Haiti any time soon? I have not visited in a decade, but would join you if you go. As for trees and charcoal, everything that you say is true. Conversely, the Dominican Republic many years ago changed to propane for cooking, thus ending the need to destroy the countryside in the never ending search for charcoal. I do not know how the DR accomplished that. What I do know is that I have never heard any discussion about Haiti shifting from charcoal to propane. That is a long range plan, but must start somewhere. Sorry, Larry, for my muddleheaded writing. I’m not going to Haiti. The point I was trying to make is that the environmental degradation of Haiti is a microcosm of what’s happening around this tiny orb we call home, namely, the short-term exploitation of resources that is leading very quickly to a planet on which we are going to find it difficult to sustain human life. Good to hear from you, friend!